Me: Hi. The shower above ours seems to be leaking. There are little drips of brown water coming through our shower ceiling. Also there is some peeling over the tub too. Please send someone to check it out. Thanks. LL: I'll send my plumber out right away. Plumber: We have to punch out the ceiling in your shower and expose you to the smell of dust and decaying wood for six weeks before we come back to do anything else. Also, now that you have no ceiling the rusty pipe water will drip on you as you attempt to clean yourself. Tile Guy: I am yet another subcontractor here to punch the tiles out from around your faucets. Me: But we don't have a leak. It's the apartment upstairs. TG: I only do what I'm instructed. Me: Great. So when you're finished today this will all be fixed? 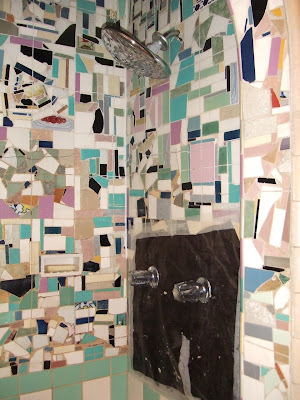 TG: No, I just punch out the tile. Then the plumber comes back. Then I fix the tile. Then they replace the ceiling. Should only take 3 or 4 more years. Me: But we've got company coming next week! 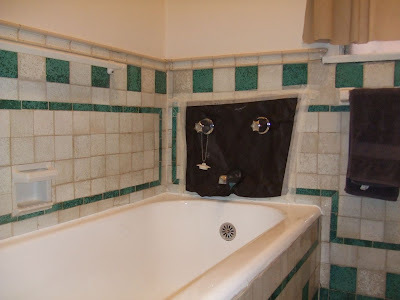 TG: But I want you to know that this original tile, which is in perfect condition and gives the apartment that vintage look that you love, is irreplaceable and I will never be able to match it to the tiles surrounding it.